Eating greens is always a healthier option for healthy life style.My mom used to include lots of green in our diet right from our child hood but these dill leaves were not available at my place.When ever we used to go to my grany's place for holidays I used to see these greens in the local markets/sabji gaadiwaala's there and I loved the fancy look of these leaves(looks like christmas tree leaves for me..he he)and we used to eat various dishes made out of these greens there in my grany's place. Here in Mumbai these greens are easily available and so I started exploring more recipes using these greens.I got few recipes from my mom in which these greens are used and here comes the first recipe which I tried using dill leaves.This is like our usual chitranna(lemon rice) just that the addition of onions and dill leaves will completely change the flavor of rice.Dill leaves have very strong flavor and so they need to be well sauted or nicely cooked before using it in any dish. Cook rice with 2 and 1/4 cups water in pressure cooker.Cool the rice slightly by spreading it over a wide plate. Wash and chop dill leaves into fine and keep it aside. Heat oil in a big kadai and crackle mustard seeds and add ground nuts and fry for a couple of minutes until they are fried and the skins start splitting up.Add chana dal and urad dal to it and fry again for until they turn light brown in color. Add green chillies,curry leaves and fry until they wither. Add finely sliced onion and fry for a couple of minutes until translucent.Now add chopped dill leaves and fry for a couple of minutes.This process takes some time,the raw smell of the leaves should go away otherwise it tastes very raw.Sprinkle some water while frying if necessary. Add turmeric powder to it and mix well.Now add cooked rice,salt and lemon juice and mix well until everything is incorporated properly. Serve it warm or at room temperature with some chips/murukku and dahi. You can avoid ground nuts and add fresh peas instead and follow the same procedure. You can avoid onions in the above recipe if you want. Hi Prathy, very delicious one here...nutritious as well with the addition of the dill leaves...Cheers! I am huge fan of this chitranna. I think this was in the list of first few dishes blogged in my blog. OMG you used shepu (in marathi) leaves for rice :0 !! Frankly I don't like the smell of this but your rice looks totally delicious ! Did the spice and rice overlook the distinct taste of the greens? Kanchan,Yes these greens have very strong smell,they need to be well sauteed in oil in order to lose their....and the addition of spices,lemon and onions will dominate the taste of the dill leaves and actually it adds nice flavor to the dish. U know wat sterday i got a pack of this dill leaves..here u r with those green leaves..Chitranna looks fantastic and i love the dill leaves strong flavour..thanks for sharing Prathy..
Never bought Dill leaves.Will surely buy & try ..Pics look awesome !! hi. i can not stand the smell of dill, but ur clicks are very tempting dear. A good flavorful rice! Beautiful presentation! Adore the way you cooked this dish. I think I can make this someday because I grew a lot of dill in my garden. Nice recipe,i used to love the smell of this leaf when i was pregnant and often ended up in making rice with dill leaves. Looks delicious and super healthy, even i am little hesitant of the smell of Dill leaves. Got to try your way to try these healthy greens. yummy rice with delicious presentation and drool worthy clicks dear. lovely! I make dill rice as well, but pretty different from yyour version. This one sounds yummy! u know what..I make a bhaji of the dill leaves and tastes amazing with bhakri !! Nice try prathy .. But I add dill leaves in buttermilk and while making bread. But this sounds good will try it out and let your know. Looks lovely prathiba! Never tried this before...shd give it a try! Great idea P, never thought of adding Sappsige to Chitranna. looks yummy, will try next time. Beautiful colour the rice is having. And each grain have sepearted beautifully. Chitranna looks amazing.. love the addition of Sabbsige soppu.Beautifuly Captured..
Wow Pratibha..What an awesome and inviting Click. It looks like its a page from a gourmet magazine.Very Professional. 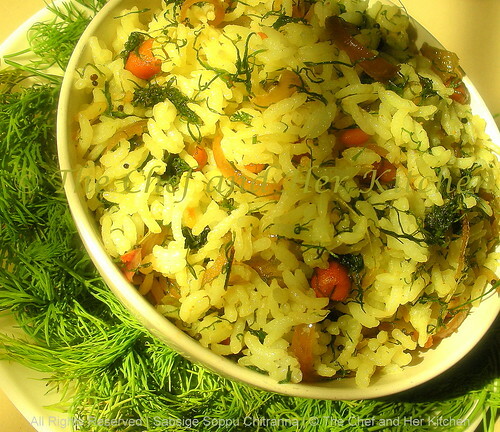 You have taken the humble lemon rice to gr8 heights by the addition of dill leaves. Looks so colorful and yummy. We love sabsige soppu at home. Whenever I make rice from it, it turns 'kahi' maybe I am missing something. I will keep this recipe in mind the next time. I just love the smell of dill leaves and add in many dishes like vada or bassaru. Chitranna looks so tempting Prathibha. Dill in rice...very new to me. that's a delight for the taste buds as well as for the eyes!!! lovely and refreshing green colour and well combined with the lemon rice!! !interesting and delicious one!!! You know what, never knew about Chitranna until I got married into a Kannadiga family.. I love this rice a lot..you wont believe have never tastes dill leaves every in my life..:P. excellent click. soooo pleasing to eyes as well as tummy. Looks soooo tempting. Ofcourse greens are great for health and this is a wonderful way to include it in our diet!!! Love the vibrant colors, very inviting!!! beautiful presentation. nice picture and looks very pretty. Hi prathiba,I could never used these leaves as I have never seen them in the places I have lived.The rice looks delish! I tried this tonight and came out well, even though I was apprehensive about onions in lemon rice. Thanks for a very nice recipe.